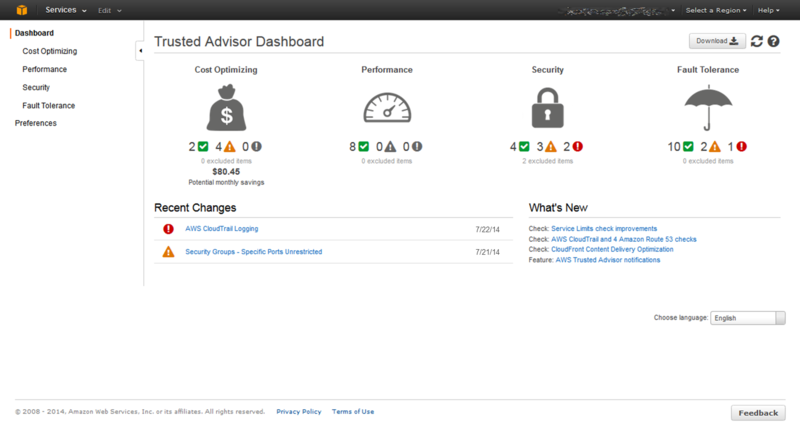 Today we are excited to introduce the new AWS Trusted Advisor console. AWS Trusted Advisor is now available in the AWS Management Console, with an enhanced dashboard and new customization features. AWS Trusted Advisor inspects your AWS environment and makes recommendations for saving money, improving system performance and reliability, or closing security gaps. Since 2013, customers have viewed over 1.7 million best-practice recommendations in AWS Trusted Advisor in the categories of cost optimization, performance improvement, security, and fault tolerance, and they have realized over $300 million in estimated cost reductions. Currently, Trusted Advisor provides 37 checks; the most popular ones are Low Utilization Amazon EC2 Instances, Amazon EC2 Reserved Instances Optimization, AWS CloudTrail Logging, Amazon EBS Snapshots, and two security group configuration checks. Recent changes: You can track recent changes of check status on the console dashboard. The most recent changes appear at the top to bring them to your attention. Action links: You can click the hyperlinks on each item to go to the AWS Management Console and take action. Access management: You can now use AWS Identity and Access Management (IAM) to control access to specific checks or check categories. For more information, see Controlling Access to the Trusted Advisor Console. Simplified dashboard: All check categories are shown in the dashboard with a count of checks by severity. Data reporting: Checks with high severity status appear at the top of each category list; you can further filter the category view by check status and exclude items from the check results. Streamlined interaction: You are alerted when a refresh is complete, and the refresh interval has been shortened to five minutes. Notifications: You can sign up for a weekly notification email with updates on check status and potential savings. Exclude items (formerly called “suppress”): You can exclude items from a check report if they are not relevant; excluded items appear separately, and you can restore (include) them at any time. AWS Support API: You can retrieve and refresh Trusted Advisor results programmatically. For more information, see About the AWS Support API.